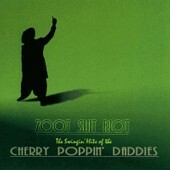 Zoot Suit Riot Album reviews. The Cherry Poppin' Daddies continue to entice teenagers' love for swing with their fourth album Zoot Suit Riot. This eight piece band puts the spirit of swing music and mixes it with punk rock, a compilation that everyone can enjoy. The Swingin' Hits of The Cherry Poppin' Daddies" was released July 1, 1997. The first single released, which pretty much made them famous, was "Zoot Suit Riot." (While the song is more than overplayed on the radio and MTV, the rest of the cd is still a worthwhile listen). Lead singer Steve Perry's voice can be compared with that of Frank Sinatra; smooth and catchy. The album isn't exactly made for children under 12, with its crass, and somewhat morbid lyrics. However, it is reminiscent of the Big Bands of the 30's and 40's to keep your parents happy. (This album is one of my father's favorites) The band also brings in some guest musicians. "Come Back to Me" features the fabulous horn section of The First Church of Sinatra. This is definitley a party CD. There are 14 tracks of "Swinging Hits" on the disc. Crank it up at any party, just don't hit repeat too many times, it can get redundant. You can also check out the Cherry Poppin' Daddies on this year's Vans Warped Tour. Editor's Note: If you are looking for a great swing cd, there are many that are much better. For instance you can check out Big Bad Voodoo Daddy or the Atomic Fireballs. The big problem I have with the band is the lack of solos in their live sets. I saw them and there was one 5 bar trumpet solo that was not on the cd. Otherwise it was an exact copy. Cherry Poppin' Daddies are actually a punk/ska band and this cd is some of their more swing songs. It is not a bad purchase, but if you want to truly swing, I recommend going elsewhere.